Sad looking elderly woman begging for some money because her picture is being taken. Marrakech, Morocco. 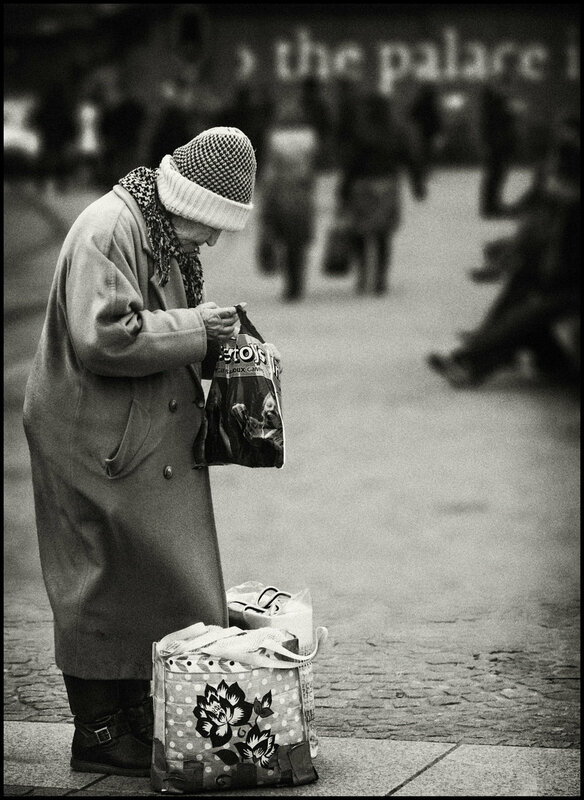 Annie (the name I gave her) is an elderly woman wandering the streets of Amsterdam, The Netherlands. Annie searching for something eatable. Amsterdam, The Netherlands. Annie found something eatable. Amsterdam, The Netherlands. Annie continues her way to one of her places where she stays. Amsterdam, The Netherlands. Annie going for a burger. Amsterdam, The Netherlands. Annie is happy that she could buy a burger. Amsterdam, The Netherlands. Annie on her way to a spot to munch her burger. Amsterdam, The Netherlands. Annie enjoying her self with her cup of coffee. Amsterdam, The Netherlands. Annie looking angry at some litter left behind on Dam Square. Amsterdam, The Netherlands. Street bum checking some waste bins on Dam square in search for some thing eatable. He already has chopsticks. Dam Square, Amsterdam, The Netherlands. Street bum checking some waste bins on Dam square in search for some thing eatable. He found a promising ice cream cup. Dam Square, Amsterdam, The Netherlands. Street bum checking some waste bins on Dam square in search for some thing eatable. Looking for more. Dam Square, Amsterdam, The Netherlands. Street bum checking some waste bins on Dam square in search for some thing eatable. Checking. Dam Square, Amsterdam, The Netherlands. Street bum checking some waste bins on Dam square in search for some thing eatable. That looks promising too.. Dam Square, Amsterdam, The Netherlands. Street bum checking some waste bins on Dam square in search for some thing eatable. Keeping an eye on the passerby. Dam Square, Amsterdam, The Netherlands. Street bum checking some waste bins on Dam square in search for some thing eatable. Enjoying the rest of the ice cream. Dam Square, Amsterdam, The Netherlands. Streetbum rolling his first joint of the day on a bench at the Nieuwmarkt, Amsterdam, The Netherlands. Young mother breastfeeding her child while begging for some money on the steps of the cathedral of Cefalù, Sicily, Italy.